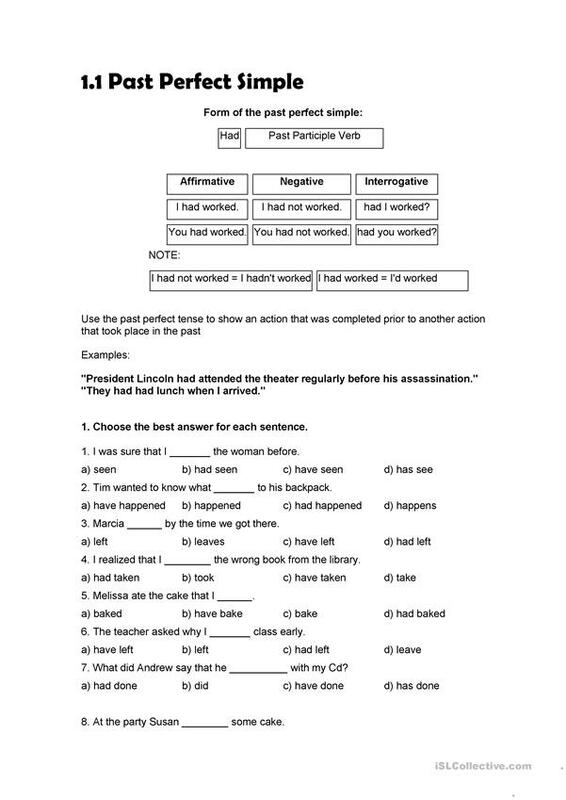 Choose the best option to wite the sentences in Past Perfect Simple. This downloadable worksheet is a great resource for business/professional students, high school students and adults at Pre-intermediate (A2) and Intermediate (B1) level. It is valuable for consolidating Participles in English, and is useful for honing your students' Writing skills. It is about the topic and words of Actions. GabydelaG is from/lives in Mexico and has been a member of iSLCollective since 2013-01-04 01:59:07. GabydelaG last logged in on 2015-09-22 23:23:49, and has shared 1 resources on iSLCollective so far.